Spot the Big Five on your own Scottish Safari! Scotland probably isn’t the first place that comes to mind when you hear the word safari. There weren’t many giraffes wondering around Aberdeen last time I was there, and those lions on Glasgow’s George Square definitely aren’t real! But this small country has more in common with the African Savannah than you might initially think. For a start we are a land of beautiful big skies and wide expanses of un-populated open space. What you might not be aware of is that, like the big games reserves of Africa, we too have our very own ‘Big Five’ animal check list and, contrary to what you might think, the Scottish big five are every bit as charismatic and photogenic as their African counterparts. So if you’re coming to Scotland this year, you’re going to need a camera, you’re going to need the check list and you’re going to need to know where to find these animals. Well, you wouldn’t go to Africa and not go on safari now, would you!? First up, who made the list? Haggis and midges I hear you say? Dinnae be a dafty. First up is the ever endearing Red Squirrel. Approximately 80% of the UK’s Red Squirrel population are found in Scotland and, although they are relatively wide-spread, these wee beauties are under threat due to disease and competition, so sightings can never be guaranteed. That said, in Dumfries and Galloway, South-West Scotland, there are a number of locations where sightings are reported almost daily, most of the year round. 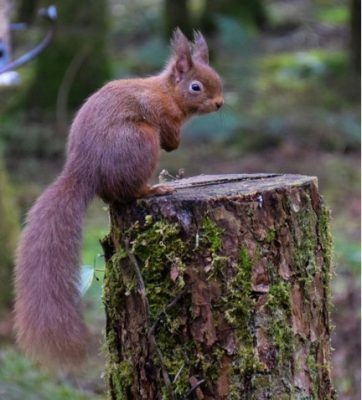 Kirroughtree Forest Visitors Centre, near Newton Stewart and Eskrigg Nature Reserve, near Lockerbie have wildlife hides open to the public free of charge (though parking tariffs apply at Kirroughtree) where you may view and photograph the squirrels to your hearts content. Both locations get pretty busy (Kirroughtree is part of the 7Stanes mountain biking centres) so best be the early bird if you plan on visiting. Next up is the Common or Harbour Seal. Harbour Seals are one of two species found around the Scottish coast (the other being the Grey Seal) and possibly the easiest of the Big Five to see due to their curious nature. 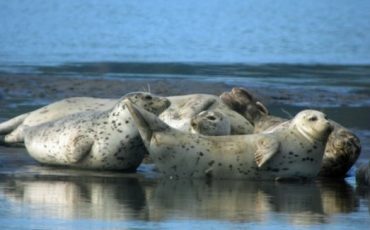 One of the hottest spots for seal watching is Findhorn Bay Nature Reserve off the Moray Firth, home to a colony of some 400 seals. No need for a boat ride as they are regularly spotted on the beach itself, lazing in the midday sun. Lucky for some eh? This area is also great for dolphin watching and the Scottish Dolphin Centre at Fochabers is definitely worth a visit. Entry is free, though donations are much appreciated, and they host a range of daily activities including guides walks, drives and land-based dolphin watches. Number 3 is another coastal curio. Despite being found in both fresh and salt water, the European Otter is probably one of the more elusive animals on the list. Of all of the areas in Scotland in which they are found, they are perhaps most synonymous with the coast of the West Highlands. The numerous sea lochs along this craggy stretch of coastline provide the perfect habitat for otters. 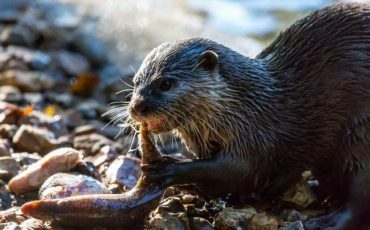 It’s no surprise then that the film Ring of Bright Water, about a man and his pet otter, was set around Seil Island, on the Firth of Lorne and Argyll and that otters are still regularly spotted at Ballachuan Hazelwood, at the southern tip of the Island. If you’re up for a bit of otter spotting, be sure to look out for their 5-toed foot prints, approximately 6-7cm in length. Red Deer, number 4 on our list, are Britain’s largest land mammal and synonymous with the mountains and glens of the Scottish Highlands. Where better to see them then than the Highland gateway of Fort William? During the October rutting season, numerous wildlife tour providers, like Wild West, offer day trips to see the deer in action. 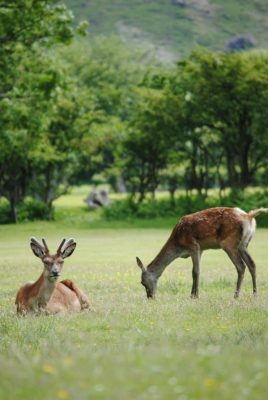 Did you know that Red Deer stags are categorised by the number of tines, the ‘points’ on their antlers. 12 tines and they’re classed as a royal stag, 14 and they’re imperial. The rarest stags, but those that get all the ladies, have 16 or more tines and are known as… Can you guess? They’re known as monarchs, hence monarch of the Glen, but don’t go counting the antlers on that painting as Edwin Landseer clearly got bored and stopped at 12. Seafari Adventures at Easdale. Their RIBs make daily trips around Scarba, stopping off at the Corryvreckan whirlpool along the way. 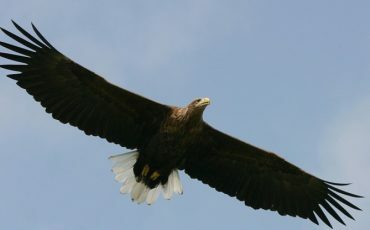 Alternatively, if 4 different regions of Scotland aren’t enough to visit in one go, Shieldaig, a small village in Wester Ross, has a resident pair of Sea eagles who harry the local fisherman when they return with their catch. Shieldaig Outdoor Adventures offer sea-kayaking trips which allow you to get that little bit closer. So there you have it, the Big Five Scottish safari list. Of course, it’s worth noting that the majority of these animals are fairly widespread across Scotland. You don’t have to go zipping up and down the country to find them, you just need to keep your eyes open and your camera to hand. For the ultimate Scottish experience however, the ‘Trip of a Lifetime’ you couldn’t ever be disappointed by a trip to all of these locations.